I’ll be the first to admit… we’ve kind of hit tourist site and ancient ruin fatigue. 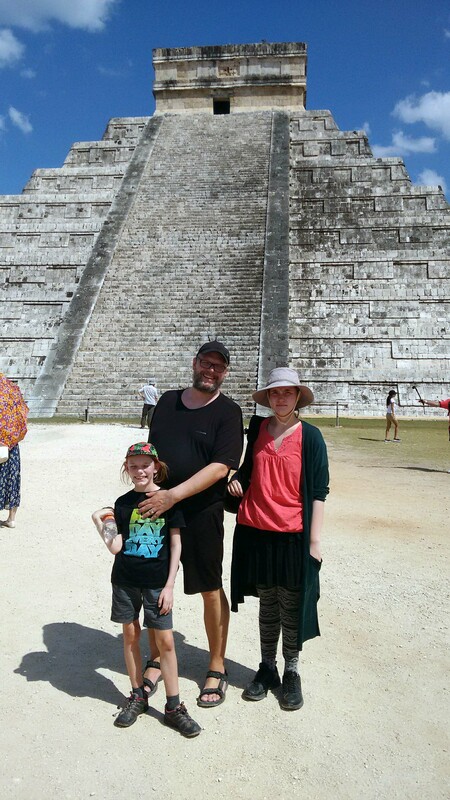 So, we debated for quite a while over whether we wanted to go to Chichen Itza or not. 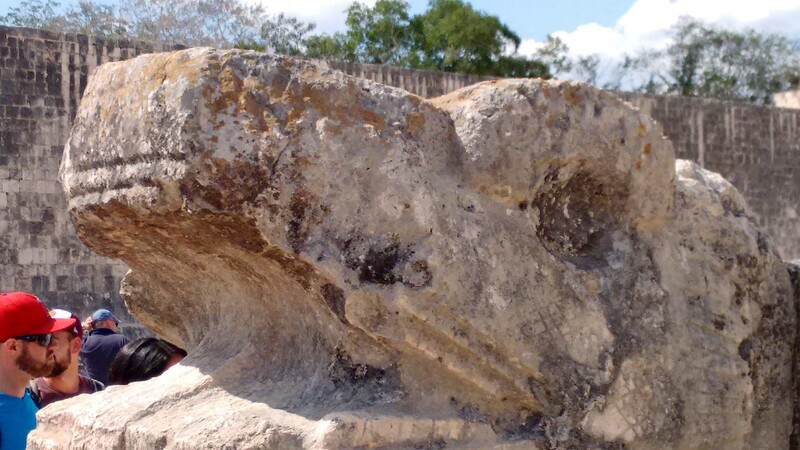 It is a 2+ hour drive from Playa del Carmen, and known to be hot and busy. Going to visit the site eventually won, and we hopped in the car towards the town of Piste. 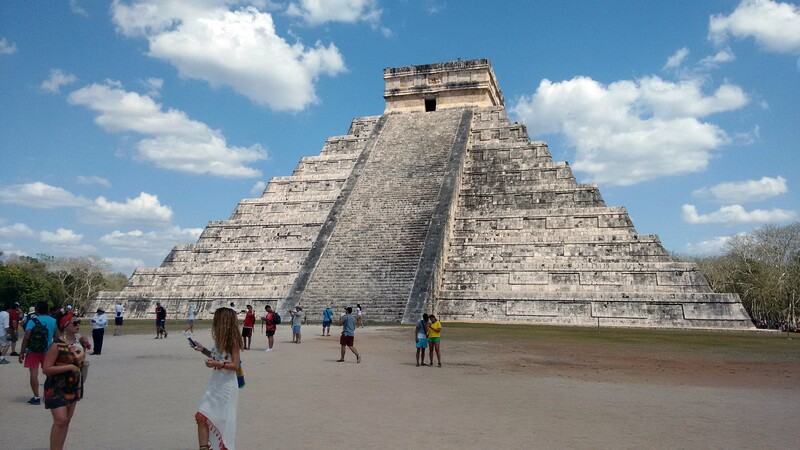 The “joy” of Chichen Itza actually starts when you are on the highway heading out of Playa del Carmen. We got stopped by semi-official looking people and waved over… only to find that they were trying to convince us to buy our tickets from them in advance. We sat in the car listening to the horrors of waiting in line to buy tickets at the site before we were waved over to the side of the road parking. 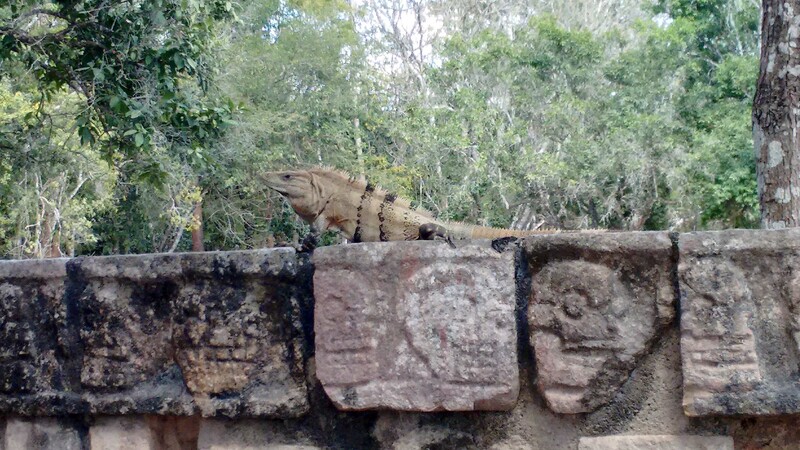 When we got to the road-side parking – I told the gentleman with the flag that we were driving to Merida and not Chichen Itza and we continued on our way. We entered a different time zone (which meant we were going to get there right at the busiest time of day vs. when the crowds would be starting to taper off. We were visiting it on the Equinox… which is apparently “the” time to visit in. I usually try to avoid visiting places at “the” time to visit them… so I kind of messed up on this one. After a little over two hours on the road, we arrived in the town of Piste. This was actually our second visit to Piste. The day our tire blew, Piste was the closest town to our break-down site and we went there initially in search of a tire repair – and we encountered many helpful people. It was kind of nice visiting the town again under different circumstances. Since we had an extra hour that we didn’t count on having, we stopped for a lovely lunch in town before venturing out to the site. The short drive out to the archeological site from town is a bit of an ordeal. The roads are fine. The signs are fine… but every few feet you will find someone either walking in front of the car – or looking “official” and trying to wave you over to the side. Both tactics are an attempt to sell you something. We finally got to the site and found parking (in the shade) and headed in. It took me about 5 minutes to wait in line to get our tickets (which was less time than it took to get through the annoying roadside ordeal that was trying to convince us that we would save so much time buying tickets from them…). Shortly after entry into the site, we were greeted by the site of the main pyramid. It is an impressive thing to behold. And apparently, what is so special about the Equinox, is that it looks like there is a snake crawling up the 365 steps at a certain point in the day. Either we weren’t there at the right time of day – or we weren’t looking in the right place… but we didn’t see a snake. I did however get a picture of Marcus and the kids in front of it. The site is quite large, and there are several other buildings that surround the main pyramid. Several have ornate carvings on them. It was too hot for my liking there (and the liking of anyone in our crew for that matter). After a few minutes in the sun, Marcus expressed that he was fantasizing about watching a documentary about the site in the air conditioning with a cold beer. When we got back to the car (which was in the shade)… the external temperature was registering as 38 C (100 F).